Need to fit a safe inside a drawer or another tight space? Then you are in the market for a small safe. Definitions may vary, but small safes are usually defined as those which measure under 0.8 cubic feet. In the home, a small safe is perfect for storing documents, passports, spare cash and keys, jewelry, handguns, and other essentials. 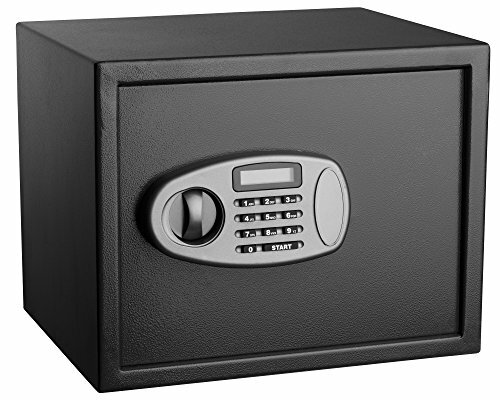 In a business setting, you can use a small safe for cash, sensitive documents, checks, money orders, and more. How do you choose the best small safe? 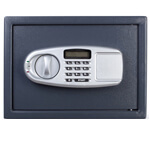 There are numerous different types of small safes out there with a wide range of features. So you will have to start by evaluating your needs and familiarizing yourself with the different types of small safes. Then you can choose the one which is most appropriate for your needs. The chart below includes a few recommendations. Any of these small safes is a potentially great choice, but you need to make sure that the safe you choose will serve your purposes. Read on more to learn all about small safes before you begin your research. 1. What type of small safe do you need? Small gun safes: These safes are specifically designed for your handgun, and may include special features for fast access, like a door that pops open when you unlock it. Many are designed to fit in drawers. Drop boxes: A small deposit box offers a portable, secure solution for cash. These can be useful for any organization which needs to keep money secure on the go. Small fire chests: This type of safe is rated for fire-proofing. It is perfect for protecting valuable possessions and documents. If it is rated for media protection, you can also store data in it. Waterproof small safes: This type of safe is rated for flood protection. Some can even withstand immersion. If the area you live in is prone to flooding, this feature can be indispensable. Free-standing small safes: These are safes which aren’t bolted down to any surface, though you can anchor them to other objects. Small floor or wall safes: These safes can be installed and concealed inside your floor or wall. If you want to keep your safe out of sight and mind, this is the type of small safe to consider. Drawer safes: These types of safes are designed with the ideal dimensions to fit inside of regular-sized drawers. While the drawer is an obvious place to put a safe, it is still a very convenient one. This size of safe also can fit well under the bed. So think about the purpose of the safe, where you will put it, and what you will put inside it. This will help you pick out the right type of small safe. 2. Who needs to be locked in and out of the safe? Next, you will need to think about access. Who will need to get into the small safe? Just you? You and your family members? Employees at your company? In which departments? Also ask yourself who needs to be kept out of your safe. Employees from other departments? Intruders? Children? This will help you to figure out how many access codes you will need, and whether you require special features such as dual codes. It can also get you thinking about the next question below. 3. What type of lock do you require? Rotary combination lock: With this type of lock, you turn a dial to get in. Digital combination lock: This type of lock includes a keypad. You punch in the numerical combination to gain entry. Biometric lock: With this type of locking mechanism, a biometric identifier is required to gain access. This is most commonly a fingerprint. Key lock: This is simply a lock which opens with the use of the key. Ask yourself which type of lock will be most convenient both for you and for other people who may need to get into the safe. Also decide if you need to be able to set custom combinations, or if you are okay with whatever combination comes pre-installed. At a minimum, you should be looking for ratings for stability and lock integrity. Fireproofing and waterproofing are mainly important if you have a need for such features. You should be extra mindful of the stability rating since small safes tend to be lightweight and portable. A poorly constructed safe may be easy to bust open simply by dropping it. Some fireproofing ratings also involve testing to make sure that the safe can survive a long fall and a hard impact—so a solid rating there may be a plus even if fire is not a concern. In terms of construction, try to purchase a safe which is made out of thick steel, including the door. The hinges should be concealed so that they do not function as a weak point. You should look for live-locking bolts as well. While portability can be an advantage with a small safe, it can also be a weakness. If you do not want someone to easily be able to make off with your small safe, you may want to mount it in place. Check to see if the safe you’re thinking about purchasing is equipped with pre-drilled holes. An included mounting kit to make it even easier to bolt down your safe. Most small safes will not contain elaborate shelving systems, but some may have a few compartments which ideal for storing very small items. 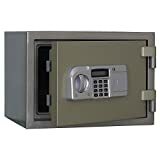 Soft interior lining is also a common feature of small safes, since many people like to use them to store jewelry, coins and other valuables which might be scratched by a hard surface. 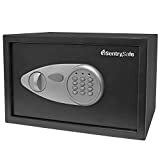 If you have chosen a biometric or combination lock (as opposed to a key lock) for your safe, you may want to choose a model which also comes with one or more backup keys. You can use these to get into your safe if the battery for a digital or biometric locking mechanism fails or if you forget the combination. Supposing a burglary is in your house, and you need to grab your gun from your small safe? For that, you will want a small safe which is designed to be discreet. That means that it should not make beeping sounds, and should have a quiet keypad. The door should also open without making any noise, and should preferably be spring-loaded so that it can do so quickly. In need of a small safe which emphasizes ease of use and which you can purchase in a competitive price bracket? The AdirOffice Security Safe may be what you are in the market for. Secured by a digital lock, it is available in a range of colors and includes some great features. Extra care and attention have gone into designing a pry-resistant door. The door is made of solid steel and has concealed hinges. Set a passcode of your choice. You get to program the safe with a code which you find easy to remember. Forgot the code? Two override keys are included with the safe so that you can always reach your valuables. The floor is carpeted. Have soft or fragile items to store in your safe such as jewelry which might be easily scratched? This safe has a carpeted floor which is soft enough to cushion these items. The safe is stylish. You can buy the safe in black, white, red, or blue. That means that it can fit in well with any home or office color scheme. While this might seem like a mere aesthetic benefit, it has another advantage. Intruders are less likely to notice a safe which blends in with its surroundings. The materials are not the most sturdy on the market. Then again, the price is far from the highest. In terms of value, it is a good deal for most household needs. Shopping on a budget for a small safe which will provide you with great construction and features for the money? 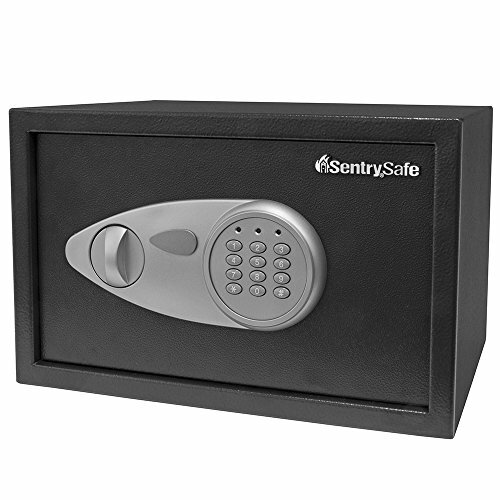 One excellent bang for your buck is the SentrySafe X055. Selling in the lower price bracket, this safe offers all the basic functionality you could ask for without breaking the bank, minus protection against fire or water. Flexible access options. You can set a combination of your choice to enter into the digital keypad for this safe. If you need an alternate means of accessing your safe, just use one of the two override keys which are provided to you. This safe meets the standards for California DOJ certification for gun storage. You can also use it to store a wide variety of other items safely. Just keep in mind that there is no protection from heat, and media may be particularly susceptible to damage in a fire. The safe is lightweight and portable at a mere 14 pounds. This is not great in terms of dealing with intruders, but sometimes you need a safe which you can easily move around. If you want to keep someone from running off with it, just anchor it somewhere. Bolt-down hardware is provided with your purchase. The metal on this safe is not the thickest on the market. But you get what you pay for, and this is a safe which was built to be economical. For those on a budget, it is still a good choice. If you want a sturdy small safe which you can open and close using a traditional dial lock for access, you may want to take a look at the Steelwater AMSWD-310. This safe features exterior dimensions of 11 3/4” x 16 1/2” x 14”, and has the advantage of being fireproof. The Steelwater AMSWD-310 can protect your possessions during a blaze. It is rated to keep contents safe for up to two hours in temperatures as high as 1850°F (1010°C). Solid steel construction makes this a heavy-duty safe. Both the outer and inner walls and the door are made out of two thick layers of steel. No plastic has been used in this safe’s construction. Even though the safe has a capacity of just 0.52 cubic feet, it weighs an impressive 75 pounds. The interior contains a removable tray. This can help you to keep the contents in your safe organized. 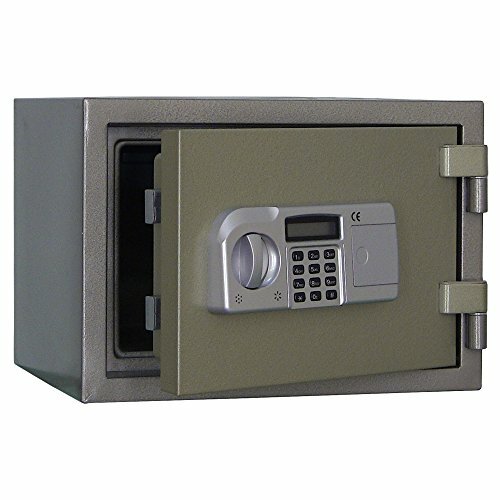 This safe features a combined key/combination lock system. This is a bit different from what most safes feature (a combination lock with a backup key in case the combination lock fails). The key is not included as a backup; it is intended to be used in conjunction with the combination dial to unlock the safe. To get in, the correct combination must be entered and they key must be used, providing a double layer of security for your valuables. There is no way you can change the combination on the safe. You have to memorize the combination which comes with the safe.